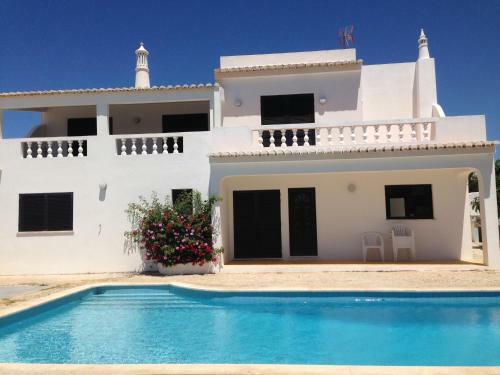 Situated in Porto de Mós, this air-conditioned holiday home features an outdoor pool. Guests benefit from free WiFi and private parking available on site. The kitchen features a dishwasher, an oven and a microwave and there is a private bathroom. Riomar is a recently-renovated hotel in central Lagos, only a 5-minute walk from a beach on the Atlantic. It features a bike rental to discover the surroundings and nearby golf facilities. Villa Guga V5 is a holiday home with an outdoor pool, set in Lagos, 2.2 km from Meia Praia Beach Lagos. You can relax by the year-round outdoor pool in the garden in fair weather. Situated a 10-minute walk from Meia Praia Beach, this hotel offers traditionally decorated accommodation with a private balcony. It features a freshwater pool, a bar and a spacious sun terrace. Free parking and WiFi are available. This family-run hotel in Lagos offers rooms with a private balcony and a surrounding palm garden with a swimming pool and sun terrace. The restaurant serves traditional Algarvean meals.